…a day and night carnival of dance music with all the fun of a day Party At The Races. Many huge names from the world of dance music to be announced, across 3 stages, in a unique, historic venue. Ladies and gentlemen, place your bets…and they’re off! 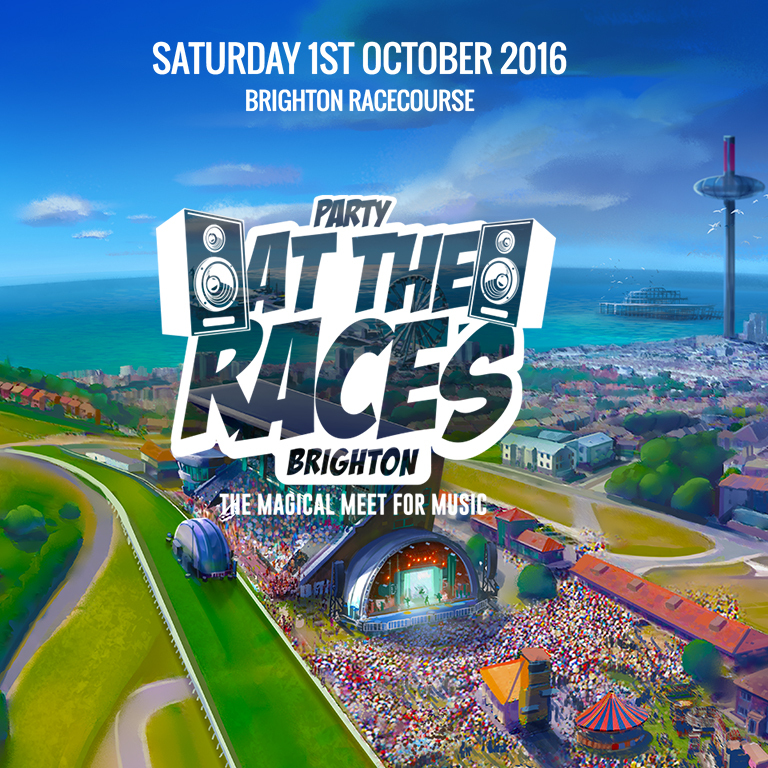 On Saturday 1 October 2016, a brand new dance music extravaganza, ‘Party At The Races’, takes place at Brighton Racecourse. This exceptional location, with views across Brighton city and coastline, will host a unique carnival of dance music and entertainment, including virtual horse racing. ‘Party At The Races’ offers a mix of day-time dancing and night-time clubbing with some of the world’s biggest artists performing across 3 stages. With tickets starting at just £16 (£29.50 VIP) for an incredible 14 hours of quality music from 1pm to 3am, ‘Party At The Races’ is all set to sign off another big summer of dance music in style. With the first DJs and live acts to be announced on Thursday 26 May, ‘Party At The Races’ will be a celebration of dance music and revelry like nothing else that’s gone before. The Main Stage will showcase a host of the biggest acts from around the world, while the Live Stage will deliver the best live music available. For quality DJs and deep house, head to the Grandstand Stage. Or for VIP ticket holders, the VIP Boutique will be playing uplifting house music all day and all night. Party people are invited to dress up for a day Party At The Races, or show off the best and brightest jockey outfits, ready to enjoy virtual horse racing, projected onto the big screens outside, and inside on the Grandstand TVs. Horses will be named after artists performing on the night, and for those that like a flutter, bets can be placed using drinks vouchers. Guests can feel the excitement of a day Party At The Races, backed by an unforgettable soundtrack from some of the best DJs and live acts out there, and, if their 10 to 1 shot comes in, enjoy free drinks all night! Alongside the mix of thundering hooves and booming basslines, visitors can also check out a vintage funfair, a range of gourmet food stalls, cocktail bars and mind-blowing, state of the art production across the various stages. Every ticket holder will have an amazing experience, but for those who want something extra ‘Party At The Races’ offers some top notch VIP options. VIP ticket holders can watch from the Jockey Club Marquee as the action unfolds, with a raised stage area, right next to the Main Stage. Also on offer are award-winning cocktails and a private VIP bar in the Jockey Club, with the hottest tropical house tunes and TV screens to keep an eye on the party! To remember the occasion, VIPs can use the special ‘photo finish’ photobooths, then access the VIP room at the Grandstand Stage, playing the latest deep house grooves, with seating available should anyone need a rest from dancing! ‘Party At The Races’ also takes the VIP experience one step further with a ‘Party In A Box’. In addition to all the existing perks this adds an Access All Areas pass and a Private Executive Box for up to 10 people, all day and all night! This is another different party experience from ‘Party At The Races’, allowing VIP guests to soak up amazing views of the event and right across the city to the sparkling seafront, while enjoying a private bar area and hostess service. This executive box comes with a TV to keep an eye on all the fun and its own music system, for anyone who wants to kick off their own private party during the event! A ‘party in a box’ gives access to the VIP area at the Jockey Club next to the main stage, the VIP Boutique, playing cool house music and the VIP Sun Terrace, where those lucky enough can soak up the rays during the daytime, along with the unmissable vibes of this unique event. ‘Party At The Races’ will offer free car parking and a free bus service from Brighton train station for the 5 minute journey to the racecourse. Pre-registration for tickets is now open until Tuesday 10 May at www.partyattheraces.com General tickets are on sale from Thursday 12 May. ‘Party At The Races’ is the last chance to party for the summer and is set to become one of the most talked about dance music events of the year.